Mariners Latest: Mojo Back At Safeco - M's Win Again! Mojo Back At Safeco - M's Win Again! Miguel Olivo has been absolutely outstanding this homestand. In fact, his last two days have been impressive as well. 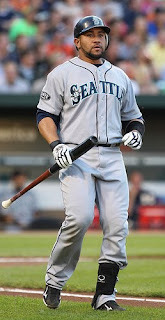 After hitting a two run homerun yesterday to bring the M's within one run, today he was a hero again. Olivo hit a 3 run homerun in the 8th inning to give the Mariners a 9 - 6 lead. The entire game was impressive. Erik Bedard gave up three runs in the first two innings and the Mariners scratched their way back in, tying the game on a squeeze play. Brendan Ryan layed down the bunt in the 3rd scoring Ichiro who was on his way from 3rd. Bedard cruised from there, leaving the game after the top of the 7th inning. With the score tied 3 to 3, Greg Halman was up with two men on and hit a 2 RBI triple to give the Mariners a 5 - 3 lead. Halman was on fire in his first game in the bigs this year. He went 3 for 4 with 2 RBI, starting in left field. Jamey Wright came in to pitch the top of the 8th and was not his normal self. He couldn't keep the ball down and ended up blowing the lead as the Rays scored 3 runs capped by a Evan Longoria pinch hit RBI single. On to the bottom of the 8th, the M's went crazy. With one out, Justin Smoak worked an 8 pitch walk, Jack Cust singled to the left side after a defensive scheme by the Rays left Longoria alone on the left side of the infield. Adam Kennedy singled, scoring Jack Wilson who was running for Smoak, that tied the game at 6 all. Then it was Miguel Olivo's turn again. On a 2 - 0 count Miguel blasted a shot over the Rays bullpen to make the score 9 - 6. The ball landed in the exact same spot as his homerun did on Friday. The M's continued the inning by loading the bases on singles by Figgins, Halman and Ichiro, but Brendan Ryan grounded out to close out the inning. Brandon League closed the door in the ninth on the Rays and sent them packing. The M's have now won 6 consecutive series and find themselves making more ground on the Angels and A's to solidify our 2nd place spot. The Rangers won again, again and again this weekend which puts us 2.5 games back from 1st after our loss yesterday. This is one crazy team to watch this year and I really think I like it. After stating that Halman was just up for back up roles and some pinch running, I think he may be making a case for himself to play everyday. If he hits like he did today, I'll let him play third, right, pitch? I like what I see today!